ORIENTATION: South African organisations are increasingly recognising the importance of attracting, developing and retaining top talent, especially management employees. RESEARCH PURPOSE: In an attempt to help organisations with retaining talent, this study focused on career success and identified specific factors that influence the career success of managers in the South African work environment. MOTIVATION FOR THE STUDY: Organisations need to establish favourable organisational conditions and human resource practices to retain their management employees. By identifying influential factors for the career success of managers, this research may help organisations to focus more accurately on their retention strategies for management employees. RESEARCH APPROACH, DESIGN AND METHOD: The present study used a qualitative research design that followed an exploratory approach. A non-probability purposive sample of 24 senior management employees was selected from two financial institutions in South Africa. Qualitative data was collected by means of semi-structured interviews and the verbatim transcriptions were analysed by content analysis. MAIN FINDINGS: Managers identified various factors that impact on their career success. One can distinguish 'external' factors (e.g. political and economic climate and business environment) from 'internal' factors (e.g. 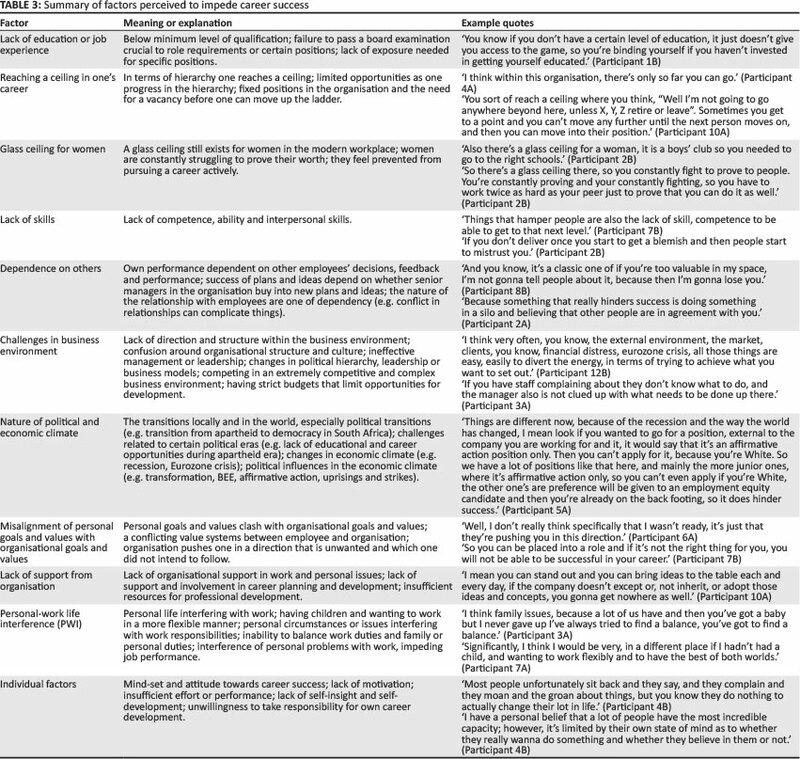 individuals' personal attributes, skills and education). PRACTICAL/MANAGERIAL IMPLICATIONS: Individuals should focus on the internal contributing factors, whilst organisations should manage the external contributing factors more effectively. Businesses constantly seek improved ways of achieving a competitive advantage in today's business environment. In this sense the knowledge and expertise of employees should be regarded as a critical strategic resource (Martins & Martins, 2011). It is thus imperative to retain those key employees who hold positions that are critical for the success of the organisation (e.g. those in managerial positions). However, the situation is that South African businesses are experiencing a general skills crisis by losing top talent or the knowledge workforce (also referred to as the 'brain drain') (Du Preez, 2002). Thus, major concerns are being raised about future career prospects for top talent in South African businesses. The government has intervened by imposing an array of mandatory regulations. However, businesses perceive some of these regulations (e.g. Black Economic Empowerment [BEE] and employment equity legislation) as impacting negatively on South African businesses in terms of global competitiveness, productivity and human development (Kruger, 2011; also Kerr-Phillips & Thomas, 2009). Therefore, retaining the talent is a macro-challenge for South African society and a micro-challenge for South African organisations, especially regarding management positions. These retention challenges in the contemporary world of work have led to a renewed interest in career development and factors that influence individuals' commitment to an organisation (Coetzee & Gunz, 2012). However, career development, professional issues and organisational career interventions in the South African work environment seem to be under-researched (Coetzee & Gunz, 2012). There is a need for research that goes beyond merely supporting career development of individuals, for research involving the effect of employee development constructs on success in careers of workers (Maurer & Chapman, 2013). Organisations should try to establish favourable organisational conditions and human resource practices that will address the varying career needs of a diverse workforce (Coetzee & Schreuder, 2009; Kniveton, 2004). This especially applies to employees in managerial positions, since no two managerial career paths are identical. Furthermore, several developmental milestones shape the human capital and motivation of these employees and thereby influence their perception of success in the workplace (Eddleston, Baldridge & Veiga, 2004). Sturges (1999) also postulates that the type of position a manager occupies may determine that person's perception of career success. This means that the managerial position as such does not determine how success is defined and attained. Colakoglu (2011) reasons that the pursuit of boundary-less careers can support but also hinder individuals' career success. In a study done by McDonald and Hite (2008), young professionals indicate that to them career success is more complex than just reaching the highest rank on a particular ladder; it is influenced by various factors. By considering management employees' perceptions of the factors that influence their career success, organisations can try to establish these favourable working conditions, as well as constructive human resource practices which may help them to retain the top talent amongst South Africa's managers. Extensive international research is available on factors influencing career success (for an overview see Ng, Eby, Sorensen & Feldman, 2005). Nevertheless, there seems to be a paucity of research into factors influencing career success, especially within the South African work setting. In an attempt to assist South African organisations with the retention of top-class employees, the purpose of this study was to identify specific factors that influence the career success of managers within the South African context, thereby helping to focus companies' retention strategies. The overall research question that guided this study was: What factors (given the South African context) influence the career success of managers in South Africa? Career success has traditionally been viewed from the perspective of the organisation. According to this view, the employee's attainment of career success implied the achievement of certain organisational goals. Or, alternatively for the individual, career success implied lifetime employment in one organisation or a steady climb up the corporate ladder (Adamson, Doherty & Viney, 1998). However, according to Eby, Butts and Lockwood (2003), in the light of the changing career environment this tendency can no longer be guaranteed. There is a shift in current literature on the career environment, according to which traditional careers are being replaced by more boundary-less careers. The latter are relatively unpredictable, disorderly and frequently include mobility across organisations (Arthur, Inkson & Pringle, 1999; Arthur, Khapova & Wilderdom, 2005). Since careers are changing more, researchers agree that they have to start building new models to understand the changing nature of careers (Adamson et al., 1998; Eby et al., 2003; Feldman & Ng, 2007; Heslin, 2005; Hite & McDonald, 2008; Mahler, 2008). This has led researchers to try and pinpoint the individual and organisational variables that play a role in facilitating employees' perceived attainment of career success (Heslin, 2003). There is an increase in literature covering the changing career environment (Adamson et al., 1998; Arthur et al., 2005; Feldman & Ng, 2007; Hite & McDonald, 2008; Park, 2010). In the light of this new knowledge, researchers came to realise that career success can best be understood as consisting of both objective and subjective components (Gunz & Heslin, 2005; Heslin, 2005; Langford, 2000). According to Judge, Cable, Boudreau and Bretz (1995), career success can be defined as the objective or subjective perception of accomplishments by individuals during their work experiences, which suggests an objective and a subjective dimension. A more detailed distinction between objective and subjective career success is found in the viewpoint of Arthur et al.(2005). According to them, objective career success is viewed as the external component of career success. This includes the observable, measurable and verifiable achievements of an individual's career situation. Such success may manifest in factors such as pay, promotion and occupational level and status (Heslin, 2003). Subjective career success, on the other hand, is based on the internal components, which involve the individual's personal internal interpretations, perspectives and evaluations of their success in the workplace (Arthur et al., 2005). Given the importance and popularity of career success in academic literature, researchers from diverse disciplines continue to investigate the individual and organisational factors that contribute or predict employees' attainment of career success, in particular the success of those holding managerial positions (Bozionelos, Bozioneles, Kostopoulos & Polychroniou, 2011; Coetzee & Schreuder, 2009; Eddleston et al., 2004; Grimland, Vigoda-Godat & Baruch, 2012; Kirchmeyer, 1998; Langford, 2000; Rasdi, Ismail & Garavan, 2011; Sturges, 1999; Tu, Forret & Sullivan, 2006). Most of the studies that explore the factors influencing career success have been conducted across international boundaries. South African studies that investigate such factors are, however, rather limited. A summary of international and national studies investigating the predictors of career success is shown in Table 1. Where international researchers seem to differ in their categorisation of predictors of career success, South African studies are limited to focusing on women and their career success. Therefore, research reflecting the factors influencing career success within the South African setting seems to be timeous. This study was undertaken as an exploratory research endeavour to gain insight into the perceived factors that influence career success of managers in South Africa. A qualitative explorative approach was used in this research. According to this approach the researcher aims to describe the lived experiences of participants as accurately as possible, without being influenced by any pre-given framework (Thomas, 2004). This is done by collecting more situational information, and determining the meanings and purposes that individuals ascribe to their actions (Guba & Lincoln, 1994). In this exploratory case study, employees were interviewed who are employed at various managerial levels within two independent international financial institutions in South Africa. Exploratory case studies aim to provide familiarity with a phenomenon by taking a good look at it, and to generate data that will provide insight into the phenomenon (Rule & John, 2011). The research setting and physical environment is crucial as it can affect the outcome of the research (King & Horrocks, 2010; Terre Blanche, Durrheim & Painter, 2006). Therefore, great care was taken to ensure the comfort, privacy and quietness of the interview location within the organisations that participated in the research. Initially, the researcher clarified the objectives and procedures with the key decision-makers within the selected organisations. That was done after permission was granted to enter the research field and to conduct the study. A specific employee (also referred to as a 'gatekeeper') was identified by the institutions and designated to help the researcher with logistical aspects of the research and to negotiate research relationships (e.g. communicating the research opportunity to employees, identifying possible participants and scheduling the interviews) (De Vos, Strydom, Fouche & Delport, 2011; Maxwell, 2005). To ensure that quality data was collected (Boyce & Neale, 2006), the researcher was trained appropriately in interviewing techniques (Neuman, 2003). Reflexivity in quality research is also of utmost importance (Boyce & Neale, 2006; Terre Blanche et al., 2006). Therefore, the researcher made time after each interview to reflect on the interview and recorded these reflections as part of the field notes. A purposive, voluntary non-probability sample of 24 managers was included in this study. These managers were selected from two separate independent, internationally recognised financial institutions. The inclusion criteria implemented were based on those of objective career success (Ng et al., 2005). Such criteria imply that participants occupy a management position or higher and have between five and ten years managerial experience. Employees who complied with the inclusion criteria and were willing to participate were included in the sample. The number of participants in the sample was determined by data saturation (Burns & Grove, 1997). The sample contained mostly English-speaking (58.30%) male managers (54.20%) between the ages of 35 and 55 years (66.60%) and was representative of various management levels (i.e. director level 29.20%, executive level 20.80%, middle management level 20.80% and senior management level 16.80%). Only a small number of the participants were employed on partner base (4.20%), or occupied other positions. The remaining categories were associate managers (4.20%) and associate directors (4.20%). In terms of years of experience, 37.50% of the managers had between five and ten years, and 20.80% had between 10 and 15 total years of experience. Interestingly, 75% of the participants indicated that they had been working for longer than one year, but for less than five years in the same position, whereas only 8% participants of the sample had remained for more than 10 years in their current work position. Data was collected in the research by means of semi-structured individual interviews. After giving informed consent, the participants were asked three standard successive questions. The first question, which served as background to the study, was 'Do you feel that you experience success in your career?' Whether interviewees answered yes or no, they were asked to explain their answer. Then they were asked the second question: 'What aspects or factors do you feel influence your career success?' The third question followed: 'What aspects have contributed to you reaching your career goals?' The aim was to encourage participants to elaborate on their thoughts, feelings, perspectives and experiences. Interviews were recorded digitally and comprehensive field notes were taken (also referred to as 'observation notes'). Field notes provide a written account of the researcher's experience through sight, hearing and thought during the interview process and can be categorised as methodology notes, personal notes and theoretical notes (Hesse-Biber & Leavy, 2004). All of the verbatim transcripts and field notes were prepared for data analysis. In order to maintain confidentially throughout the process, the interviews, field notes and transcriptions were labelled by a coding system exclusively known to the researcher involved. The anonymity of the audio files' content, as well as of the transcription and field notes, was upheld for this purpose and all the data was stored in a secure place. The obtained data was analysed using content analysis. This entails a systematic technique that gathers and compresses large bodies of text into specific and identifiable content categories, which can be analysed (Hesse-Biber & Leavy, 2004). Content analysis focuses on content and contextual meaning of the text. In this sense the analysed data helps the researcher to draw replicable and valid inferences (Hsieh & Shannon, 2005). As a starting point, the researcher read the interviews several times thoroughly, in order to get a larger picture of the content. Thereafter the responses of the participants (comprising the actual text) were categorised into meaningful units of sentences or paragraphs. These units were categorised or sorted into two major themes. Careful analysis of these themes resulted in the deduction of various smaller, comparable sub-themes. The researcher and the co-coder discussed the analysis and agreed on two themes and the sub-themes that were deduced. Another aspect of data analysis was to work through the field notes taken by the researcher (De Vos et al., 2011). Field notes documented in this research revealed neither noteworthy new meaning, nor contrasting evidence or findings. Principles with respect to quality data were upheld in this research. These principles include accuracy, context and density of descriptions, usefulness and reflexivity (Richards, 2009). More specifically, the following methods were employed: (1) pre-pilot interview training, (2) clear and careful descriptions of each stage of the research, (3) comprehensive field notes taken after each interview, (4) an independent co-coder, (5) critical open discussions between the researcher and co-coder on the process and the results of the data analysis, (6) feedback sessions with the management of the participating organisations on the overall findings of the research and (7) clarification and confirmation of themes with some participants. According to Weber (1990), one of the major concerns about content analysis is the bias of the rater; hence, he suggests a coding scheme for data analysis. Such a coding scheme was developed and discussed between the researcher and an independent co-coder. According to Hesse-Biber and Leavy (2004), a co-coder's role is to contribute to the reliability and validity of the data. The overall quality of the data could be enhanced by collaboration between the co-coder and the researcher, which helped to identify and establish the relevant themes and sub-themes. This was done during an open discussion between the researcher and co-coder in which the themes and sub-themes were evaluated. In the subsequent findings section, the two major influential factors and subsequent sub-factors are discussed. Data analysis yielded various factors that contribute to or impede the career success of managerial employees (see Figure 1) and these are discussed below. Table 2 and Table 3 summarise these factors and provide example quotes from the responses. Table 2 illustrates specific factors contributing to the success of managers. After further scrutiny of these contributing factors, it seems that some factors are aspects that managers can address or attend to in order to enhance their perceived career success. These factors almost suggest that managers (and other employees) can do something in order to contribute to their success. For example, managers can obtain an excellent education, can perform, can enjoy productive relationships and networks and can be open to feedback, all of which may contribute to their success. On the other hand, some of the contributing factors are not always aspects to which managers can attend; these are perceived as external factors contributing to their success. These include factors such as the element of luck, provided opportunities, working within an organisation that espouses a developmental culture of sharing knowledge, as well as being supported by managers and colleagues. These are factors that organisations can look at in order to ensure that employees and managers are successful in their careers. Opposing these contributing factors, factors hindering or impeding the success of management employees were also extracted from the interviews. Specific factors as listed in Table 3 seem to hinder or impede career success for managers. Several factors that impede managers' career success (see Table 3) seem to be related to the organisation as well as its responsibility and culture. For example, some managers explained how they had reached a ceiling in their career: the more such a manager progresses hierarchically in the organisation, the fewer opportunities and positions are available to them. There seems to be this tendency: once someone has reached their peak in the organisation, such a person may get stuck in that position. This may inhibit any further progress, and consequently career success. Organisations sometimes also force managers in one direction within the organisation, which is completely different from the direction they themselves envisage for their career path as managers. Managers sometimes feel they are not given enough opportunities to grow in their careers (this implies not only opportunities for hierarchical progression). Lack of support from the organisation was also mentioned as a significant factor hindering career success, especially when managers need the organisation to 'buy into' their career, in terms of new ideas, plans and strategies. If not, the growth and development of their career will be limited or even non-existent. Although it seems that organisations and external aspects impede managers' success considerably, participants did indicate their own shortfalls. According to the participants in this sample, several internal factors do impact negatively on the development of their careers. These include their own lack of motivation and limited self-insight, as well as lack of education or skills. In an era focused on attracting, developing and retaining a knowledgeable workforce, the pursuit of boundary-less careers can support but also hinder individuals' career success (Colakoglu, 2011). When reviewing the research question posed in this study (what factors influence the career success of management employees? ), two types of factors were forthcoming: contributing factors and impeding factors. Contributing factors entailed mostly factors that enhance, improve or increase career success, whereas impeding factors were those factors that hinder, obstruct, hamper or delay the attainment of career success. 'Can do' factors such as education, interpersonal skills, network relationships and performance. External factors such as element of luck, opportunities provided, developmental culture of sharing knowledge and supportive managers and colleagues. Organisational or business-related factors such as the glass-ceiling effect, economic climate, business environment and lack of support. Individual factors such as personal attitudes, lack of skills and education, personal-work life interference. Of the contributing factors managers mentioned, several are in accordance with international literature that is focused on predictors of objective and subjective career success (i.e. education, networking interacting with successful individuals and performance). In previous studies by Eddleston et al. (2004) and Nabi (1999), education and hard work were found to be significant predictors of objective career success. Although networking and consultation with mentors and skills development were not related significantly to objective career success in the Eddleston et al. (2004) and Nabi (1999) studies, managers in the sample of this study did indicate that interaction with successful individuals did contribute to their career success. This might be related to the specific South African context with its mandatory regulations and legislations (such as BEE and employment equity legislation). It might be that managers feel that this background almost necessitates the use of mentors and interaction with successful individuals in order to succeed. This is also in line with findings of McDonald and Hite (2008). Managers elaborated on this factor by explaining that they specifically attempt to display the attributes or characteristics of successful individuals, which contributes to their perceived success. Continuous learning and being part of an organisation that provides support for learning and development is also known as a significant predictor of subjective career success (Maurer & Chapman, 2013; Park, 2010). This corresponds with managers' view in this study that a developmental organisational culture with shared knowledge and skills development is perceived as crucial for their career success. This is not surprising since South African organisations do focus on skills development, via the implementation of workplace skills plans and the opportunity of the organisations to obtain funding from the government for skills development. Given this opportunity, organisations in South Africa have an added advantage of establishing a developmental organisational culture, which could enhance the career success of individuals, as explained in the present study. The contributing factors identified in this study relate to a large degree to the interpretation of the predictors of 'knowing why', 'knowing whom' and 'knowing how' about career success, as they are conceptualised internationally (Eby et al., 2003). Contributing factors such as being open to feedback may correspond with the 'knowing why' predictors (e.g. openness to experience and career insight); interaction with successful individuals may correspond with the 'knowing whom' predictors (e.g. networking) and a developmental organisational culture may correspond with the 'knowing how' predictors (e.g. engaging in continuous learning). Although the majority of the contributing factors that emerged from the present study are found in international literature, additional new unique impeding factors also emerged. The element of luck, which participants explained as 'being at the right place at the right time', as well as the maintenance of productive interpersonal relationships with others within the work environment are both aspects that were not noted in previous studies. 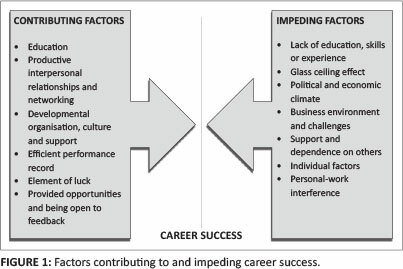 When considering the impeding factors identified in this study, interestingly, similar factors contributing to career success were also found amongst those factors reported to impede career success. For instance having an appropriate educational background and holding a good performance record are seen as beneficial to employees' career success, but in some instances lacking certain levels of qualification or lacking exposure or experience are factors that impede their success. These impediments, taken together with the lack of specific competencies or skills, as well as lack of support from the organisation, certainly could inhibit managers' career success. Impeding factors identified through this research are in accordance with Supangco (2011), who argued that career success depends on the actions of both the organisation and the individual. Findings in the present study suggest that the majority of factors impeding the career success of managers in South Africa are related to the organisational environment in the work context of South Africa. Factors mentioned are political influences in the economic climate, lack of skills, business environment challenges and glass-ceiling effects. These factors are plausible given the impact of South African issues and regulations on business performance in South Africa, as reported by Kruger (2011) and Abbott, Goosen and Coetzee (2013). The present study has highlighted certain South African issues mentioned in these previous studies (e.g. BEE, education or skills development, legislation in general, politics, economy, inequality, employment equity, labour relations and transformation). It was found that these issues currently not only influence businesses in South Africa but also impact on the career success of managers. Together with the work setting impeding the career success of managers, individual factors also seem to play a role. Managers did mention the lack of motivation and self-insight. Some managers are unwilling to take responsibility for their own actions or careers as aspects that may inhibit their career success. Although some studies have investigated the role of personality or personal attributes in career success (Seibert & Kraimer, 2001; Wu, Foo & Turban, 2008), studies investigating specific behaviours that employees exhibit and how those influences their career success is lacking. It is imperative that South African organisations establish favourable working conditions and human resource practices that may help with the retention of managers. Therefore, such organisations should attempt to enhance or emphasise the importance of the factors contributing to career success, whilst trying to reduce the effect of factors impeding such success (e.g. having informative workshops on these factors with employees on a regular basis). Findings in this study suggest that both the individual and organisation can implement strategies to ensure career success and thereby help to retain the top talent in organisations. Overall, in terms of the contributing factors, individuals (employees) should focus on the 'can do' factors, where their efforts and attention could contribute to their success. Although organisations should emphasise and encourage such aspects, employees should take responsibility themselves and focus on establishing networks, educating themselves and performing within the organisation. Organisations should emphasise the need for efficient performance amongst employees and encourage them to deliver above and beyond the promises they have made in terms of performance. On the other hand, the organisations should also help employees by 'managing' the external contributing factors more effectively. Organisations need to foster a developmental organisational culture with shared knowledge and development of skills by encouraging shared knowledge and continuous learning. They should support individuals' actions to require these abilities, by providing opportunities for further studies and developmental programmes. As such, organisations are responsible for creating working environments that are conducive to career development (McDonald & Hite, 2008). When considering the impeding factors, again the focus is on the organisation and the individual. Employees need to be more informed about their personal attributes that may influence their perceived attainment of career success. In the literature, a vast number of sources are available that deal with specific personality attributes related to career success (Ballout, 2009; Boudreau, Boswell & Judge, 2001; Seibert & Kraimer, 2001). Eby et al. (2003) also emphasise the importance of individuals managing their own careers, rather than expecting their employer to manage it for them. Although employees should understand that it is their responsibility to manage their careers, the present findings suggest that organisations should also understand that managers' careers in South Africa are to a large extent influenced by external organisational or business-related factors, for example legislation and regulations for BEE. South African organisations should investigate strategies that specifically will address those aspects that seemingly are impeding the career success of managers. Future research studies should explore influential factors in more depth, specifically by focusing on South African issues, which do not only influence the performance of the business but also the career success of individuals. Another impeding factor mentioned was managers' dependence on other employees (i.e. in terms of decisions, feedback and performance). One way to diminish this problem is to point out this type of relationship to employees and managers alike. This could be done by means of specific interventions aimed at effective group work, interpersonal skills training or efficient conflict management. It is important to counter the possibility of misaligning personal goals and values with organisational goals and values. Kuijpers and Scheerens (2006) emphasise this notion of career competencies in the modern career. Therefore, employees should be encouraged to explore or identify organisational values at the beginning of their employment within the organisation concerned. This implies a new focus for organisations regarding their induction programmes for new employees. These programmes should clearly indicate the organisation's values and its expectations of employees who work within such an environment (Järlström, 2000; Jiang, Klein & Balloun, 2001; Schein, 1996). Unrealistic work aspirations could discourage the performance of management employees. Therefore, regular discussions on career progress and career path are suggested. During these discussions employees can be provided the opportunity to communicate their career needs and career plans and share the progress they have made to date (Schein, 1990; 1996). Notwithstanding the rich in-depth contributions of this study to help understand the dynamics of factors that influence career success, some important limitations are worth mentioning. One such limitation is that the managers in this sample were selected from financial institutions. Thus, the factors recognised and explored in this study could possibly be only representative of the particular organisations and their cultures. However, the participants' responses may still be typical of what managers in South African workplaces experience, thereby allowing for the transferability of the findings (Appleton, 1995; Terre Blanche et al., 2006). Considering cross-cultural differences in terms of the conceptualisation and experience of career success (Ng et al., 2005), another limitation is that the sample was not representative of the different cultural groups' diverse languages: the majority of the sample was English-speaking. Future studies incorporating more participants from different cultural or language groups might reveal additional perspectives on career success. In order to retain top talent in organisations, the investigation of factors influencing the career success of managers is crucial. Although the present findings suggest that both the individual factors and organisational factors can contribute to or impede the career success of managers, the role of the organisational environment in the work environment of South Africa is considerable. The material described in this article is based on work supported by the National Research Foundation (NRF) under the reference number TTK20110823000025405. Any opinions, findings and conclusions or recommendations expressed in this material are those of the authors and therefore the NRF does not accept any liability in this regard. In addition: the author wishes to acknowledge and thank Ms S. Visagie for conducting the interviews and assisting with the data analysis on this project.